Venture out of Egypt to track down the stolen artifacts of Queen Nefertiti in this epic Marble Popper game! The ancient queen`s earthbound spirit calls on you to reclaim her sacred artifacts and return her soul to the ether! 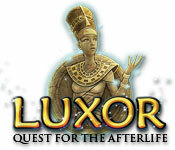 Arm yourself with the falcon-wing shooter of Horus and explore the exotic Near East in the epic Luxor: Quest for the Afterlife! Not only does Big Deck Solitaire have the computer solitaire game you've been looking for, it also has numerous other variations of the game you can play for hours and hours! Play this classic card game! Click the highlighted cards to start, then add your cards to the piles by placing a card one above or one below the top card of either pile (suit of the cards does not matter). There are no turns, place the cards as fast as you can! First player to use all their cards wins! Embark on an ethereal mission using your Match 3 game-playing skills to release the essences of some of the most powerful Egyptian gods. Remove an evil curse that has caused a whole kingdom to be trapped in their dreams! Save a beautiful princess before it’s too late!